Mother Sawyer and her devil/dog. But why did communities need witches, and why did the witches comply? Evidently, in the early sixteenth century about 80% of England’s population was rural. The manorial system was breaking down, so poverty increased, leading to more desperate times and of course, more desperate measures. When cattle died or crops failed, there needed to be a scapegoat. And what better scapegoat than one who doesn’t fit in– what Kinney calls “unassimilable women”? This reminded me instantly of the symposium I recently attended at Duke: “Thinking through Death: Corpses and Mortality Strategies in Medieval and Early Modern Europe” [check my twitterfeed for Oct 19]. At the symposium, Diana Presciuti gave a presentation on fifteenth-century Italian paintings of a saint who reassembled and revived a victim of maternal infanticide. Each image illustrated that patriarchal anxieties about infanticide and cannibalism were at once “utterly alien but uncomfortably close to home” for men who feared even the most domestic women. To men frightened by women within the home, women living without the patriarchal buttressing of the “standard” domestic setting must have seemed even more horrifying. But what about these women? Are they only the victims of social construction? Not in their literary forms, I don’t think. What makes early modern drama so awesomely exciting is the tension between victimization and choice. What complicates this further are the uncomfortable overlaps between necessity and evil, justification and sin, predestination and despair. Particularly, it’s the very idea of justification– and the horror of its potential realities– that so motivates The Witch of Edmonton. The witch of Edmonton was real. 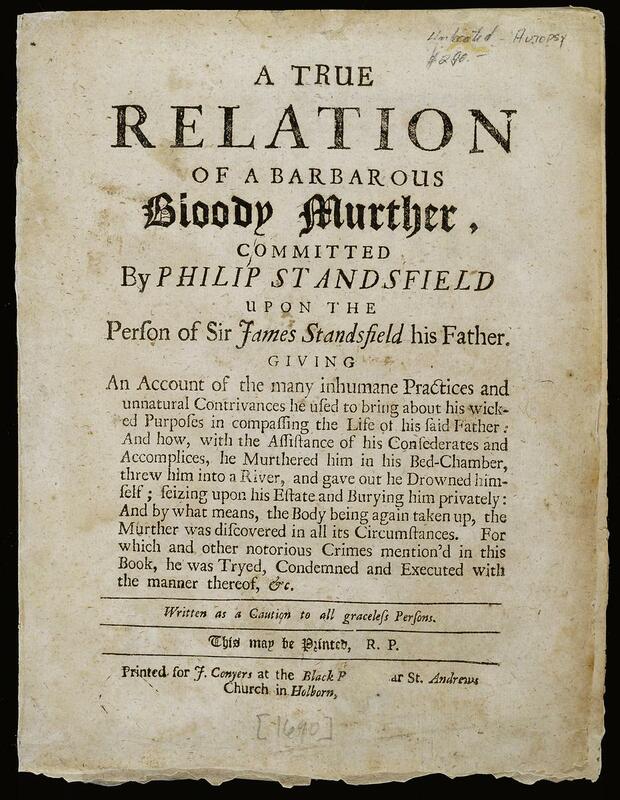 Murder pamphlets were popular for generations. This is a late 17th-century example. Yep. 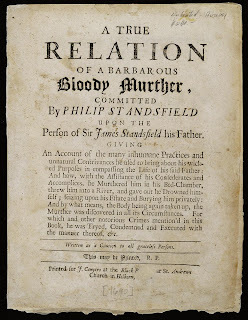 The play was inspired by the real trial and real execution of real woman. The details of these events were published by HER CHAPLAIN– a man in the habit of publishing and profiting from the confessions of the condemned under the auspices of “exempla.” This guy makes Chaucer’s Pardoner look like Santa Claus. In what kind of state must someone be in to utter these words? How is she understanding her own complicity in her witchiness? Does she think she had a choice? Most importantly, does she know, or can she sense, that her role as a witch was one that the community required of her? If so, is her demonic demise a device of her her own wicked will, or of inevitable fate? “Mother Sawyer” has been stealing firewood from her neighbor, who hits her for the theft. We quickly learn that the whole village thinks she’s a witch. Inevitably, she stops fighting it and embraces the label. Ironically, she learns how to be a witch by what she hears from the rumors. The stick-stealing-turned-neighbor-beating is the last straw for her; she curses her neighbor and declares that she wants revenge. And as soon as this declaration is made, Dog appears (as a dog in name and form, though he is admittedly a devil). 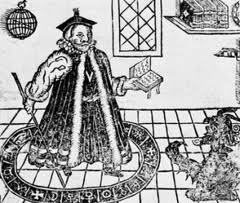 You see, in the early modern theology explored here and by Marlowe in Dr Faustus, a demon appears any time someone disavows God. Indeed, Dog’s first words are, “Ho! Have I found thee cursing? Now thou art mine own” (II.i, 120). In both plays, then, the devil comes when he’s called. In Marlowe’s play, there are some pretty intense suggestions that Faustus is already damned. If he isn’t one of God’s elect, there’s nothing he can do about it– his is a hopeless case. But the tensions of “God’s elect” and “reprobate” are not as pronounced in The Witch. The playwrights show her to be an impoverished victim of her cruel community more than a power-hungry academic driven by boredom and hubris (Faustus). And in a play that opens with a pregnant woman threatening the good name and fortune of two men (the second plot), we know that ladies have more than marginal or superficial roles. There are whole scenes dedicated to onlookers and rumor-mongers– to those looking upon, judging, and condemning the “unassimilable woman.” In this sense, The Witch is nearly opposite Faustus. Sawyer is condemned outside her home by her neighbors who point and jeer. 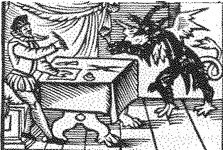 Conversely, Faustus calls the devil into his study, to the ignorance of most of his friends. Hers is a public offense; his a tellingly private and personal transgression. Still, Sawyer’s character is no mere scapegoat. Like Faustus, she knowingly makes a contract with a devil in her own blood. And as my students have pointed out, a blood oath usually betokens something bad. Surely she knows that she’s involved in an evil act. In the play, the first thing she asks of her demon familiar is that he kill her neighbor. He can’t (or won’t), but we now know that she has violent intentions. NB: If you’re about to sign in pen and the second party suggests you sign with blood instead, RED FLAG. Sawyer is arrested, tried, and hanged. Her last words are those of regret; she sees that she has not been in power at all: “There is no damned conjuror like the Devil” (V. iii, 51). This seems like an admission of guilt. But could it be an indication of her victimhood, too? If the real Edmonton needed witches, does Sawyer’s conversion suggest that she was more “assimilable” than we thought? I invite you to reflect on this post about communities, choices, and the legacies of both. So close to an election, our choices make all the difference.